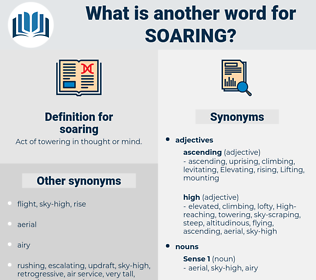 What is another word for soaring? Act of towering in thought or mind. worsening, flourishing, overheating, growing, ascending, escalating, plummeting, Appreciating, resurging, broadening, greater, Furthering, intensifying, climbing, Enlarging, incrementing, mushrooming, recovering, swelling, augmenting, heightening, rallying, burgeoning, thriving, spiraling, spiralling, simmering, Boosting, galloping, emerging, rebounding, rapid, exploding, expanding, Rocketing, improving, Spiking, flying, Evolving, lengthening, billowing, advancing, Enhancing, Undergoing, rushing, booming, deepening, incurring, reviving, jumping, widening, gliding, Fledging, scaling, bouncing, Lifting, Stepping, Flushing, Amounting, surging. He lectured fully an hour and a quarter, and his humorous sayings were interspersed with geographical, agricultural, and statistical remarks, sometimes branching off and reaching beyond, soaring, in the very choicest language, up to the very pinnacle of descriptive power. He began seriously to, hope that his negotiations would be successful, and was for soaring at once into the regions of high politics, when the king suddenly began to talk of hunting. 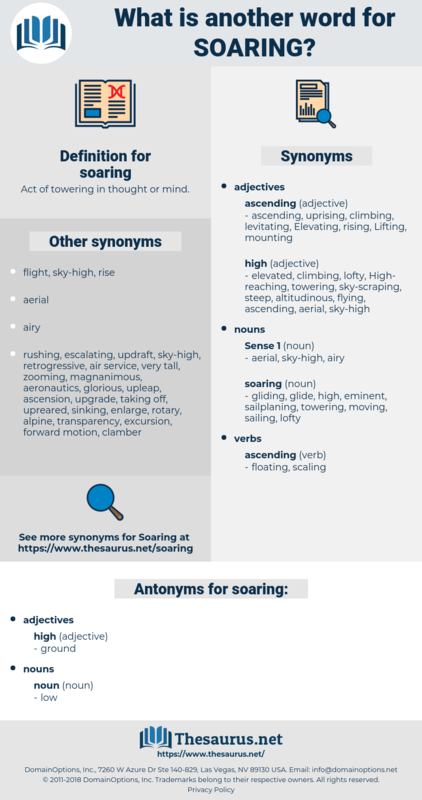 scaramouch, scraunch, secureness, scrounge, sayornis, screaming, s wrench, skirmish, scoring, sure enough, scrunch, sereness, squirming, soreness, sureness, scranch, shrinkage, schizosaccharomyces, serinus, square inch, shrewmouse, sour mash, scouring, sorriness, squareness, shirring, syringe, souring, saccharomyces, syringa, sorrowing, sour mash whiskey, screwing, Syringa Josikaea, serranus, scrummage, shearing, syrinx, sour orange, scurrying, sourness, swaggering, sugariness, swearing, surmise, screw wrench, sharing, Syringa Josikea, scrimshaw, shrink, screening, scrimmage, sarong, Saccharum Munja, sure-enough, shrunk, sermonise, shoring, scrawniness, scaramouche, sermonize.